For many decades under Christian missionary teachings, Hawaiian beliefs and traditions were suppressed. Kalākaua did not support such teachings, and instead he and his queen, Kapiʻolani, lived by the motto, “Hoʻoūlu Lāhui,” Increase the Nation. He advocated for a renewed sense of pride in all things Hawaiian such as the arts, medicine, music, and hula. 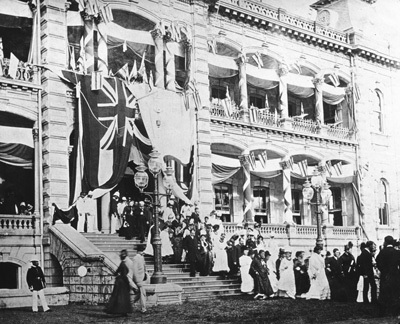 ʻIolani Palace, constructed during Kalākaua’s reign, was not only a symbol of Hawaiian ingenuity and sovereignty, but of the grandeur and lavishness of his rule as well. Ancient Hawaiians had no written language, but used oral traditions like chant and hula to record such things as genealogy, mythology, history, and religion. Hula, the dance of Hawaiian people, was one means by which culture was expressed and chronicled. The King not only relied on these traditional forms of documentation, but during a time of heightened literacy in the islands, Kalākaua spoke with kūpuna, elders, eventually compiling their stories into a book, “Legends and Myths of Hawaii.” By supporting the practice and expression of Hawaiian knowledge, Kalākaua ensured that future generations would inherit a robust Hawaiian heritage. The Merrie Monarch Festival steadfastly works to maintain the teachings of our kūpuna, and we strive to perpetuate the history and culture of Hawaiian people in a manner that respects those teachings. Through our efforts, along with those of other organizations, we seek to ensure that the unique traditions of Hawaiian people will continue to flourish. King David Kalākaua commemorated his 50th birthday with a two-week celebration of Hawaiian culture on the ʻIolani Palace grounds. 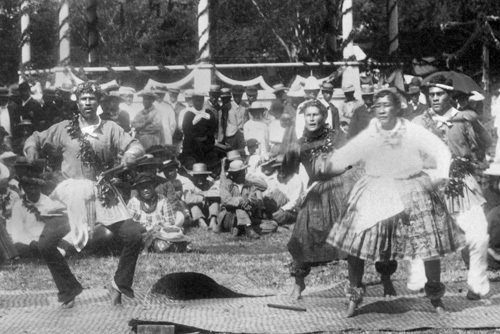 Known as the “Silver Jubilee,” the 1886 festivities featured hoʻopaʻa (chanters) and ʻōlapa (dancers) performing in public for the first time in years. 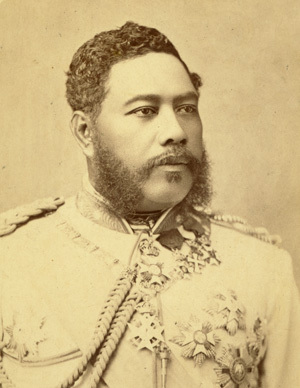 A parade wound its way through downtown Honolulu to the palace, where throngs of well-wishers lined up to offer gifts and pay their respects to Kalākaua. One gift was a book, “Nā Mele ʻAimoku,” compiling 48 chants honoring the king, past rulers, and other traditional compositions passed down through the generations. Today, this rich source of traditional chants provides us with insights into the poetic expressions of the Hawaiian language. Every year the Merrie Monarch Festival continues what the king started, by hosting a week-long festival of music, crafts, art, demonstrations and a hula competition. During festival week, the grandeur, pride, and spirit of the Silver Jubilee is alive in Hilo, Hawaiʻi.